People with sensitive skin often face an uphill battle in finding makeup products that work for them. A makeup product looks beautiful at first, but after using it for a while it winds up causing redness and irritation. It’s enough to make you think makeup just isn’t for those with sensitive skin—that doesn’t mean you should quit your search. We’re here to arm you with info that makes it much easier to find the best makeup for sensitive skin. Having sensitive skin means playing a not-so-fun game of trying to figure out exactly what causes your skin to react. While it might be difficult to pinpoint everything that makes your skin unhappy (sensitive skin is very individual and can be finicky), some cosmetic ingredients are almost guaranteed to be a problem. Surprisingly, many such ingredients do show up in makeup. One of the biggest categories to avoid is fragrance. Fragrance and fragrance ingredients (like ethylene brassylate, linalool, and limonene) can be potent irritants that are more likely to affect those with sensitive skin. Other ingredients that can cause sensitive skin to flare up? Drying alcohols, like denatured alcohol, witch hazel, citrus extracts, and “essential” oils are all problems for sensitive skin. Just like fragrance, they can lead to irritation. That irritation might not be apparent the first or second time you use a product, but over time you’ll find your skin becoming more sensitive because of these ingredients. Another sneaky culprit? The preservatives methylisothiazolinone and methylcholorisothiazoline. Often used instead of the unfairly maligned parabens, these preservatives are known sensitizers when used in leave-on products. 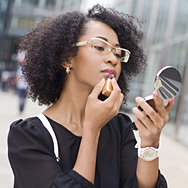 If you’re a fan of makeup products that have sunscreen, check the label to see what the active ingredients include. Although synthetic sunscreen actives, like avobenzone and octinoxate, are great at providing sun protection, many people with sensitive skin find they cause irritation. Instead of these, choose a formula that contains the mineral sunscreen actives titanium dioxide and/or zinc oxide. These ingredients are exceedingly gentle, even when applied near the eyes. Also, and we cannot stress this enough, it’s important that you remove your makeup completely at the end of the day. Sleeping in your makeup can push it deeper into skin, leading to sensitivity, clogged pores, and patchy redness. Don’t choose just any makeup remover, though! Many products designed to take off makeup contain irritating ingredients, including alcohol and fragrance. Thankfully, there are gentle makeup removers and cleansing oil that do a great job of removing makeup (including waterproof makeup) without aggravating your sensitive skin.